The eldest member of 2AM pop boy band, Lee Changmin, came to the filming set of KBS2TV drama Dream High 2 which continued to shoot even in the cold weather, to support the the fellow 2AM member Jung Jinwoon and JYP Park Jin Young. Jung Jin Woon embraced Lee Chang Min and they had a kindly conversation, showing a distinctive code of brotherhood. 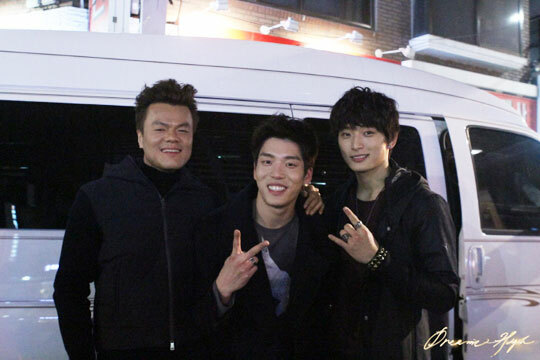 Chang Min, JYP and Jin Woon shot a photo together, the atmosphere was warm. Chang Min also cheered other actors, adding vigor to the shooting scene. In addition, the love line of “Dream High 2” is receiving attention by the audience.